Do you fancy a two-hour food, drink and laughter sensation? That's what the Daily Telegraph calls this innovative theatrical experience, a production like no other where you play a starring role. When the audience plays the diners in the ‘Faulty Towers’ restaurant, pretty much anything can happen. And it does. A full two thirds of the show are cleverly improvised, with gags flowing fast from the very offset. You don't even get to sit down at your table before the funnies start. 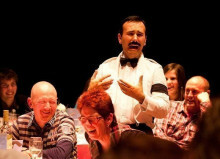 And they don't stop throughout this fast-paced and incredibly clever two hour comedy tour de force, starring the well-loved Basil, Sybil and Manuel, whose job it is to serve the audience a 1970s-style three course meal, mayhem included. This internationally acclaimed show was born in Brisbane, Australia, two decades ago, created as a mark of respect for the BBC’s brilliantly funny sitcom written by and starring the wonderful John Cleese and Connie Booth. Hundreds of thousands of people around the world have seen it since then, and the show has developed into something seriously special, enacted by nine teams of actors touring twenty countries a year. Faulty Towers is in its fourth year in London’s West End, at the Amba Hotel in Charing Cross, and is proud to hold a TripAdvisor Certificate of Excellence. This is world class comedy, you're right in the thick of it, and you'll end up hysterical with laughter. Great food, great entertainment, an exceptional theatrical experience. What more could you want? An excellent evening of Fawlty Towers style acting, great jokes, fab acting and general good all round britishcomedy rude behaviour. One of the funniest evenings we've had in years and the food was good too. Only negative are the drink prices... crazy expensive in the venue bar so go to the main bar in the hotel. Highly recommended. Faulty Tower, politically incorrect, hilarious! I went on my own and it was lovely - got chatting to my table mates and everyone had a really good laugh! Hilarious show. Laughed all night. loved the show , food good , actors brilliant , fantastic way to spend a afternoon .just laughed all the way through apart when i was eating . 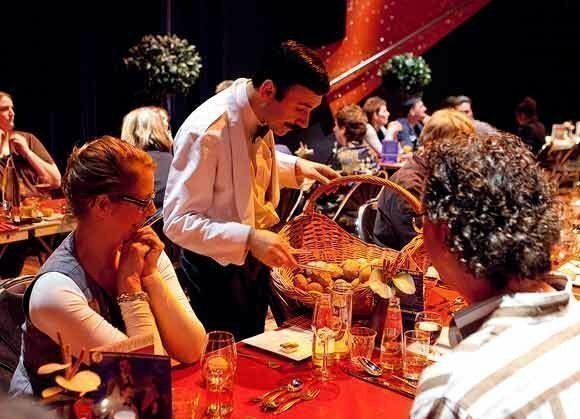 It was one of the best dinner shows i have been to, side splittling funny and so interactive. A great night outt for everyone who remembers the TV show. One of the best things about the show was how the actors integrated the audience into the show. It added so much. Also brought a lot of great memories of the original TV show back. I highly recommend it. Thought the food wouldn’t be good but it was lovely. Actors did really well. I laughed so much my mouth hurt at the end of the evening. Didn’t want it to end. Loved it. Haven't laughed so much for years. Actors role play was excellent and entertaining for the full 2 hours. An excellent show not to be missed. Certainly very entertaining for people who like the Fawlty Towers TV show. Entertaining,clever without being too confronting. Food was good. Great night out. The show was really. The food was OK but for the price, a free drink, be a beer, could be included. 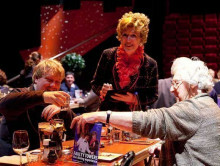 We had a great time at the Faulty Towers Dining Experience, it was funny right from the beginning to the end! We were sat on a large table and got to know our fellow diners. The actors were very believable and they recreated lots of chatter from the original series. We felt like part of the show as we were included a few times and Cybil remembered our names and our conversation with her. Manuel was hilarious and Basil was fantastic. Thoroughly recommended. This was brilliant, laughed till I cried, well worth the money and food was delicious. 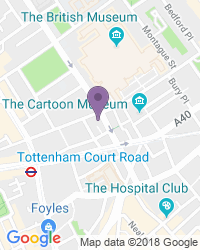 The only fault I would say, is that information given to where to go, dosent tie up with name on the hotel, I just happened to go into hotel to ask if they knew where it was, as we were lost!!! But everyone after us, was comin in asking if they knew where the box office was. The acting was good. The surroundings not fantastc- the basement of a hotel - didn’t offer much coziness. Good food and talented reenactment. Basil nailed it! Enjoyed the tv series and thought it was worth a visit. Haven't laughed so much in years. Audience participation can make the show even funnier. The actors had the characters of to a tee. Well worth watching. Laughed all the way through. Food was good, everyone was friendly. After watching the show for years I was amazed how realistic the experience was. The room was very plain with five tables of 10 where we had a simple but tasty meal. The only problem was someone had bought a child of about 6 who when the actors included him burst into tears. Most of us where of a certain age and everything was so authentic and the three actors ab libbing was great fun. They included all of us in one way or another and I am so glad we went as was a very funny interactive lunch. They do two shows most days. Definately a must visit if you remember the show and those younger ones watch it on Netflix and go along. Totally entertaining. Fun evening with food and a reprise of the well-known Fawlty Towers gags. Well acted, particularly Sybil. Food not bad. Nice atmosphere, meet other people while you dine. 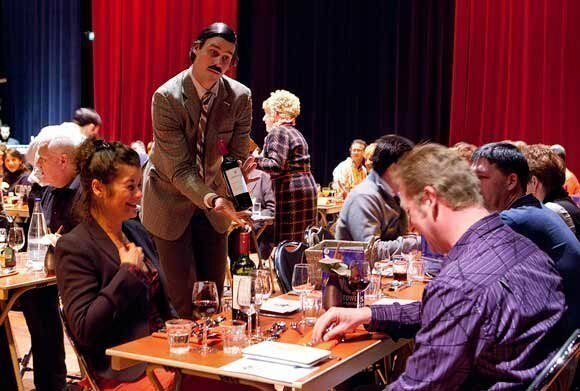 Everybody takes part one way or another in the dining experience which is brilliant. We felt actually we were watching one of the serious as it was so good. My son claimed his jaw hurt of laughing. Brilliant acting and humour. Very funny show. Worth seeing. Saw this dinner theater with my 13 years old twins. The recently watched all the shows and had fun interacting with the actors. We had a hard time finding the venue but glad we did! Food was very average but it didn't matter. It was more about the experience. Shared tables so you got to meet people from all walks of life. Good fun, but don't go if you like to be challenged. It's extremely simple humour, and no 'story' per se, but wonderful all the same, and the actors were amazing. Very disappointed that I have not had any replies to any of the emails I have sent asking what the photos were being taken for and how I view them (someone ?from the hotel) was taking lots of photos during the performance and I don't know why. Great Vintage Clean Fun!! LOL!! We really did not know what to expect but the food, the "action" and interaction were hillarious - I have not laughed so much for ages! The actors are amazing, they had the characters down to a T which is to their true credit to take on such loved and treasured characters, the original cast are a hard act to follow but these guys did it exceptionally. I want to go again! This diner show was a riot and very reminiscent of the sitcom. Basil, Sybil, and Manuel were perfectly played by the actors. Plenty of interaction with the diners but all tastefully done, at least as tasteful as these characters can be. 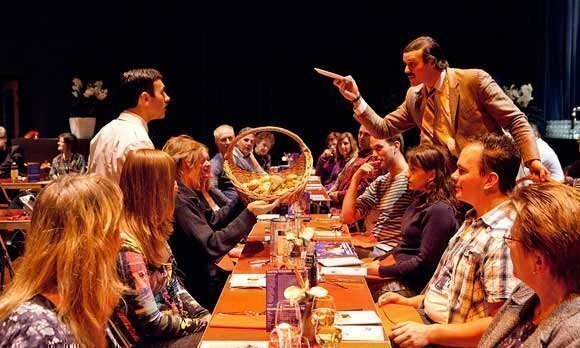 Faulty Towers the Dining Experience: Excellent. Watching Basil tell our 16 year old daughter how to eat properly while calling her Madam: Priceless! Don't believe the review about the service being bad. That is the damned point! If the service were good it wouldn't be Fawlty Towers! From the moment we walked in the experience started. All the actors were excellent in their roles. I would highly recommend this experience to all, even if you have never watched Faulty Towers. The overall performance and food was sublime. Fun evening, something different for people that appreciate Fawlty Towers! This was a great night, laughed from the time we sat down to dinner till the time we left. The actors were so true to character that you felt you were the dinners in the original to show. Manuel was amazing. Highly recommended. Amazing! A unque experience. The actors are very talented, tackled every unscripted senario seemlessly and professionally. Excellent entertainment a laugh a minute, sketches performed were in keeping with the TV series, don't wear light clothes just in case a roll drops in your soup. Not a theatre show. Acting based around a dining experience therefore music not applicable. A very enjoyable experience and very funny. Best night out in years! What a brilliant evening! My family can't say enough good things about how much they enjoyed the evening! A brilliant experience, we laughed so much! Just the right size, a small and intimate number of diners meaning that you really are immersed in the entertainment! Thank you! Excellent show,Actors carried off the characters they played extremely well. Wouldnot hnesitate in pointing other people towards this show for 2 hours of good fun. 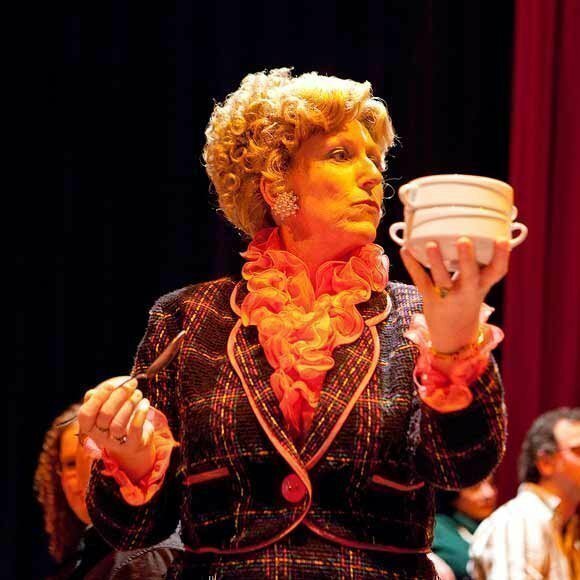 From the moment we arrived we were entertained by the cast, throughout the whole experience Basil, Cybil and Manwell were fantastic they acted it out brilliantly, will definitely tell friends and family to go and do. A really fun evening with lots of laughs. The storyline and actors were great! A must see! Very pleasing blend of set pieces from the Fawlty Towers series and ad hoc comedy as Basil, Sybil and Manuel roam the large dining room during an otherwise normal large scale dinner service. Hilarious interactive evening for FT fans! Very entertaining, the actors were fantastic at involving everyone and ensuring a thoroughly entertaining evening. The food is quite average but the show was wonderful. From meeting up in the bar and being taken to your table the laughter starts. All 3 of the actors were superb and visited all of the tables making sure everyone took part. They had audience members giving the bread and butter out but no one was ridiculed it was just hilarious. Great evening out. The acting was great. The food was plain, but very well done. Hillarious .... like being in an episode! This was hilarious from start to finish. A great depiction of the real characters from Faulty Towers. The energy in the room was amazing and the ad- libbing fantastic. The food was very passable too and we had a most memorable night out. A must if you're in London...thoroughly enjoyed! Food a bit like school dinners but then I think its meant to be? Serious comedy. Feel good factor on overdrive. The cast were effortless in recapturing the essence of Fawlty Towers. A perfect elegant setting. From the pre-drinks to final curtain everyone was involved and taken along on the Basil, Cybil and Manuel magic carpet. Fabulous show enjoyed by all. Audience participation was very well executed and really added substance to the overall experience. Small and intimate venue which again added to the whole experience. Highly recommend to anyone who is familiar with Faulty Towers. 5 * and a big thumbs up. If you like Faulty Towers you will absolutely adore this show. Lots of audience participation and haven't laughed so much and for so long in ages. Our party of 8 ranging from 63 - 30 all gave it 10/10. Music & lighting review not applicable. Well worth the money. Would highly recommend! One of best night of this year! I'd seen quite a bit of Fawlty Towers, and was pleasantly surprised to see there was a show based on it. Naturally, I decided to go see it, and I was certainly not disappointed! From start to finish, laughter abounded. I was also amused to find that when I spoke Norwegian, I was replied to in the same language, just as Basil Fawlty would've done if he knew the language. It was an absolutely brilliant show, and I'm definitely recommending it to everyone with a taste for British slap-stick and silliness. A must see... such a great way to enjoy a meal!! Crazy from start to finish. Went on first night in London what a great introduction. 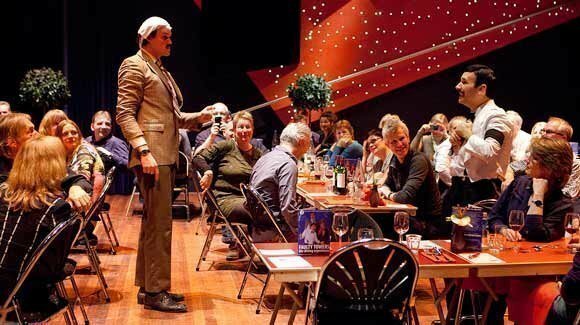 The food isn't brilliant, but the fawlty towers sketches & performance by the "lookalikes" were very enjoyable and amusing. Very well done show with the bonus of a good dinner. The actors are very professional, funny and with such an interactive show, they adapt well to the different audiences. If you're a Faulty fan or even just a part-fan, this is a really great night out. If you don't enjoy a laugh and good old fashioned slap stick this is not the show for you. It was hilarious from the moment it started to the end. The Actors engaged with everyone and were brilliant at their parts. The food was ok but the show made up for any shortfall on that side of it. Just like the series - only better! Loads of fun! really recommend! We thoroughly enjoyed the whole experience, it was a very good version of the original comedy, very funny and lots of interaction with the guests. Only dislike was the main course, I'm a vegetarian and found the pasta to be rubbery and bland, however the desert was amazing. Very cost effective and worthwhile, have recommended to friends who are looking forward to booking it. A good throwback with a good cast, and good food. Apart from a mishap with the booking where they had us down for 20 tickets, instead of 2, we could not fault the evening. The actors were outstanding. They had the accents and mannerisms spot on. We didn't stop laughing the whole time. They used a lot of the storylines from the series including the German walk and the Betting Slip mixup. There was a lot of audience participation and everyone was up for a laugh. A night to remember. Would go again. 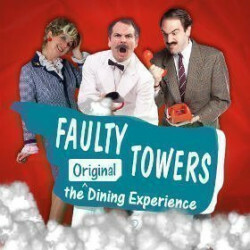 Use the search box at the top left of this page to search for Faulty Towers The Dining Experience tickets availability.